This is $30 of food. Well, $29.16 to be exact. On minimum wage, a person would have to work 3 hours to afford this with their take-home, after-tax pay. There’s no way you could feed a family on this. Is it any wonder that people aren’t eating healthy anymore? For the same money I could’ve brought several bottles of fizzy drink, half a dozen bags of potato chips, a week’s worth of instant noodles, and a couple of chocolate bars, if they’re on sale. Granted, smoked salmon isn’t the cheapest choice but it was really cheap today. This isn’t my usual shop – but it’s about right for pricing. I can see why taking the family to McDonald’s can be a cheaper option. Is it just here, or do you face the same thing where you are too? where on earth do you shop? This morning at Pak n Save I got a lettuce, 3 capsicum, a cucumber, 3 tomatoes, hummus, tin of beetroot, Brazil nuts, mixed nuts, soy snack things. $30 bucks. Add hard boiled eggs from my own chooks and there is lunch for 3 days at least. Food prices in NZ and Oz are terrifying. People say the UK is expensive, then I explain I would pay £8.00 for a quiche in Oz. you get two for £3.00 on offer here! It’s crazy! I remember eating so well in the middle of London and thinking it was super cheap. Middle of London. The mind boggles. 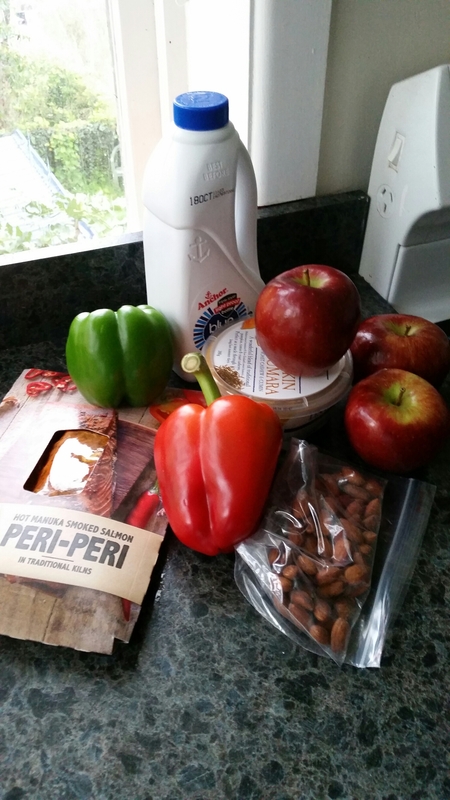 I think it can be tricky to eat healthy on a budget, but I think it can be done. I don’t envy those with food intolerances or allergies who have to try and shop on a budget though!